The term ‘innovation’ is frequently used in business today. For many, the term means providing ideas out of the blue, which lead to mind blowing discoveries and achievements. While this might be the perceived outcome of innovation, the reality is that true innovation can arise in a variety of different forms and can have any sizeable impact, and a healthy dose of creativity and idea sharing must be encouraged if businesses are to effectively harness the innovative potential of its employees. At Marvell, we pride ourselves on working together collaboratively and creatively and this enables employees to be the most innovative versions of themselves, and such is what largely contributes to our sixth consecutive year of inclusion in the Clarivate Analytics Top 100 Global Innovators list. Placement on the list has become the standard measure for innovation across the world and is recognized as a significant achievement. 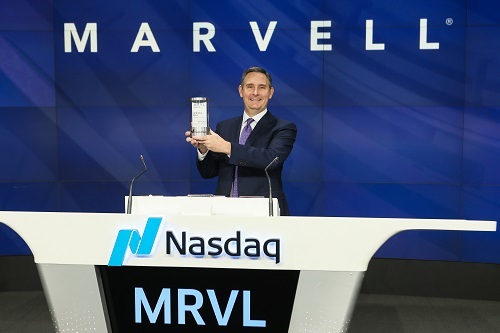 The award itself is based in part on global reach — we hold more than 9,000 patents worldwide — grant success rates and influence of patented technology, and it serves as a testament to Marvell’s culture of innovation and commitment to providing differentiated, breakthrough technology solutions. So while we extend our congratulations to colleagues and competitors alike, without whom there would be no yardstick to measure ourselves by and no goal to aim for; we can’t wait to see what new innovations and types of critical and creative thinking this year will bring. At last week’s 2017 OCP U.S. Summit, it was impossible to miss the buzz and activity happening at Marvell’s booth. 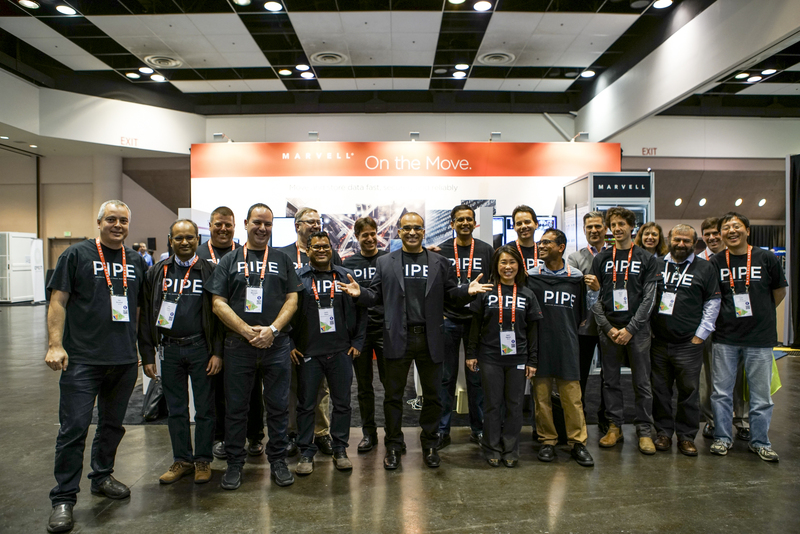 Taking our mantra #MarvellOnTheMove to heart, the team worked tirelessly throughout the week to present and demo Marvell’s vision for the future of the data center, which came to fruition with the launch of our newest Prestera® PX Passive Intelligent Port Extender (PIPE) family. Marvell kicked off OCP with two speaking sessions from its leading technologists. Yaniv Kopelman, Networking CTO of the Networking Group, presented “Extending the Lifecycle of 3.2T Switches,” a discussion on the concept of port extender technology and how to apply it to future data center architecture. Michael Zimmerman, vice president and general manager of the Networking Group, then spoke on “Modular Networking” and teased Marvell’s first modular solution based on port extender technology. Until now, data centers with 10GbE and 25GbE port speeds have been challenged with achieving lower operating expense (OPEX) and capital expenditure (CAPEX) costs as their bandwidth needs increase. As the industry’s first purpose-built port extender supporting the IEEE 802.1BR standard, Marvell’s PIPE solution is a revolutionary approach that makes it possible to deploy ToR switches at half the power and cost of a traditional Ethernet switch. Marvell’s PIPE solution enables data centers to be architected with a very simple, low-cost, low-power port extender in place of a traditional ToR switch, pushing the heavy switching functionality upstream. As the industry today transitions from 10GbE to 25GbE and from 40GbE to 100GbE port speeds, data centers are also in need of a modular building block to bridge the variety of current and next-generation port speeds. 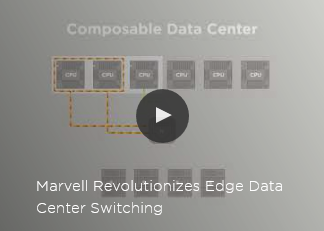 Marvell’s PIPE family provides a flexible and scalable solution to simplify and accelerate such transitions, offering multiple configuration options of Ethernet connectivity for a range of port speeds and port densities. Amidst all of the announcements, speaking sessions and demos, our very own George Hervey, principal architect, also sat down with Semiconductor Engineering’s Ed Sperling for a Tech Talk. In the white board session, George discussed the power efficiency of networking in the enterprise and how costs can be saved by rightsizing Ethernet equipment. The 2017 OCP U.S. Summit was filled with activity for Marvell, and we can’t wait to see how our customers benefit from our suite of data center solutions. In the meantime, we’re here to help with all of your data center needs, questions and concerns as we watch the industry evolve. What were some of your OCP highlights? 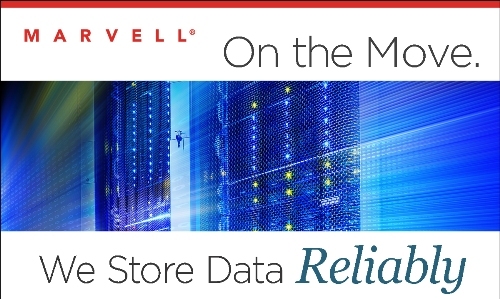 Did you get a chance to stop by the Marvell booth at the show? Tweet us at @marvellsemi to let us know, and check out all of the activity from last week. We want to hear from you! When you sit in a car today, the focal point of the interior is likely an infotainment system. From displaying vehicle diagnostics to parking assistance to enabling multimedia streaming and additional controls such as phone calls, navigation, etc., the infotainment system has become the touchpoint of the in-vehicle connectivity experience. 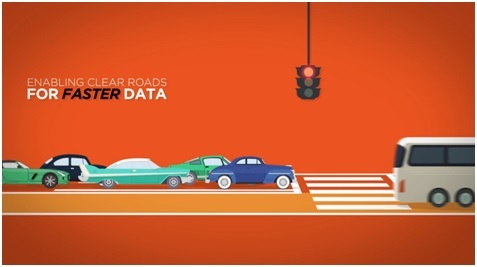 In order for drivers to take full advantage of these advanced features, internal vehicle data networks need to provide high bandwidth and seamless connectivity so these technologies can effectively communicate with each other. However, with multiple in-vehicle systems using different interfaces and connectivity technologies, how can we bridge the communication to get them to speak the same language? The IEEE’s Ethernet standards act as the connectivity backbone to seamlessly link the different domains of the car such as infotainment and Advanced Driver Assistance Systems (ADAS). Marvell is proud to have played an instrumental role in the development of the IEEE 802.3bp 1000BASE-T1 PHY standard which enables data between in-vehicle systems to be distributed over a flexible, low cost and high bandwidth network. In October 2015, Marvell introduced the 88Q2112 automotive Ethernet physical layer (PHY) transceiver, the industry’s first 1000BASE-T1 automotive Ethernet PHY transceiver based on the IEEE’s draft 1000BASE-T1 spec. Leveraging our advanced wireless and Ethernet technology solutions, the 1000BASE-T1 solution supports uncompressed HD video, ideal for distributing camera and sensor data in ADAS applications. In the infotainment space, gigabit Ethernet over a single unshielded twisted pair copper cable is a logical solution for transporting audio, video and voice data at a higher data rate and resolution. 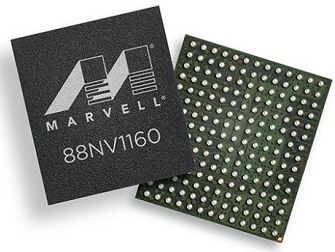 Marvell’s 88Q2112 PHY transceiver enables automakers to use one Ethernet switch to connect the multiple advanced features of tomorrow’s cars. Furthering our commitment to automotive innovation, in April 2016 we opened the Marvell Automotive Center of Excellence (ACE), a first-of-its-kind automotive networking technology development center. Located in Ettlingen, Germany, ACE aims to expand development and education efforts to advance the architecture of future connected, intelligent cars. We showcased Marvell’s advanced auto connectivity solutions at the 2016 IEEE-SA Ethernet & IP @ Automotive Technology Day (E&IP@ATD) in Paris this past September, demonstrating how our technology supports multiple HD video streams with up to 4K resolution. Covering the exciting activities at E&IP@ATD, Tadashi Nezu of Nikkei wrote about our automotive connectivity leadership, noting that Marvell is rapidly coming to the forefront of the market. 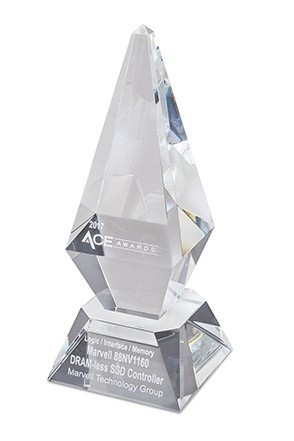 Nezu also lauded the Company for its early Ethernet development efforts, noting how Marvell quickly developed a solution compliant to the draft IEEE 802.3bp 1000BASE-T1 standard, before the specifications were even finalized. Earlier this month, we presented our solutions at the heart of the world’s automotive development at the 3rd annual Automotive Ethernet Congress in Munich. Manfred Kunz, head of development at the ACE, spoke about automotive Ethernet security, while Christopher Mash, senior manager of automotive system architecture and field applications, co-presented with Bosch and Continental who shared their experience with the new 1000BASE-T1 technology. We showcased several automotive Ethernet solutions across nine customer booths, including the world’s first 1000Base-T1 Automotive Ethernet system, industry-leading intelligent security on the new 88Q5050 switch and a new platform demonstrating Marvell’s 10Gb capability for automotive. 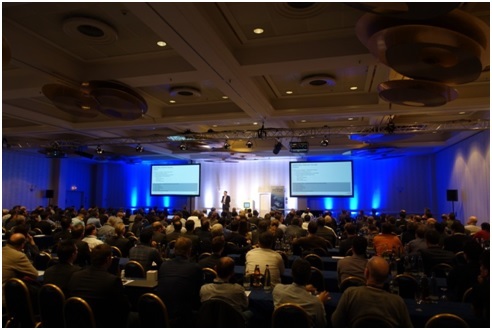 The event was a success, drawing over 700 attendees, as well as speakers and exhibitors from over 20 countries. As automotive technological developments continue to advance rapidly and data continues to play a fundamental role in advancing the future of connected cars, we look forward to continue innovating and collaborating with our auto partners to further accelerate car connectivity. 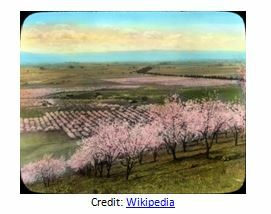 Before Silicon Valley became synonymous with high-tech and innovation, it was known as the “Valley of Heart’s Delight.” This expansive piece of land boasting acres of orchards just south of San Francisco would grow to become the future home to some of the world’s most innovative tech companies. Looking back at the area’s history, it’s no surprise that it would someday inspire a culture where groundbreaking tech comes to life in a garage, college dorm room or even at a kitchen table. The story of Silicon Valley itself begins in a garage, with two Stanford grads William Hewlett and David Packard, who would later found Hewlett-Packard in 1939. Throughout the next decade, entrepreneurs and scientists would come to the Santa Clara Valley to explore radio, military and electronic technology, laying the groundwork for the future hotbed of innovation. 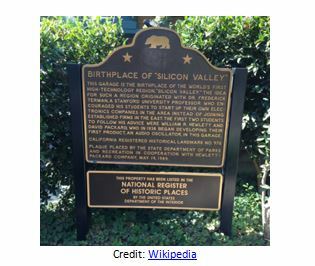 By 1953 notable tech companies began to officially establish ground in Santa Clara Valley with property in Stanford Industrial Park, closely followed by the area’s first semi company in 1956. With the Space Race in full force throughout the 1960s, the country experienced a heightened focus on the need for advanced silicon technologies and the valley began to take shape as the country’s hub for advanced high tech. Due to the sheer number of silicon companies in the park and growing attention on the semi industry, the area was officially coined “Silicon Valley” in an Electronic News series published in 1971. Over the next 30 years, some of the world’s most groundbreaking technology companies would make their way to Silicon Valley. Marvell officially became a part of the phenomenon in 1995, right in the middle of the dot.com bubble. Since then, we’ve seen firsthand how the tech scene has grown exponentially through innovation and entrepreneurship. The startup mentality that originated in 1939 and which continues to boom in the 21st century inspires us to continue improving, innovating and challenging technology of today. At Marvell, we are confident in our vision for the future of silicon, data and cloud technologies and look forward to being a part of the next generation of great entrepreneurs, thinkers and tinkerers in Silicon Valley. We are only a couple of weeks into the New Year and already have a glimpse of how the industry will take shape in 2017 and beyond. 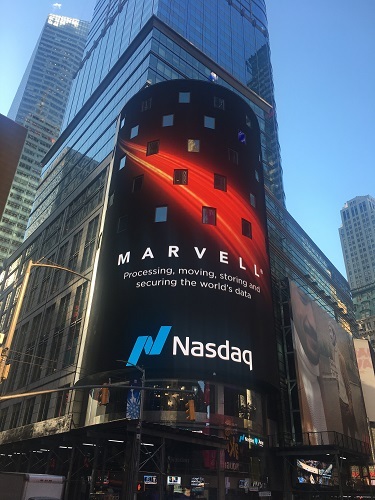 It has been a ritual for the Marvell team, and most major players in the technology ecosystem, to start the first week of the year showcasing the cutting-edge solutions of today and tomorrow at CES. This year, the Las Vegas expo floor showed us that everyday objects, as well as cars, are getting smarter and are taking on new capabilities, signaling new demands for the industry to address. The race to fully autonomous cars continues with new automotive tech ranging from improved sensors for Advanced Driver Assistance Systems (ADAS) to new displays and infotainment systems. Automakers introduced the integration of cloud-based voice assistants, which is bound to revolutionize the way we will interact with our cars. Virtual reality (VR) developers focused on creating better content and tools to bring VR to the mainstream. Companies shared plans for gesture tracking and untethered headsets to deliver immersive experiences for gaming, entertainment and enterprise applications. In the near future, we can expect access to more VR, augmented reality (AR) and mixed reality (MR) content and experiences, such as shopping in virtual retail stores. While automotive tech and VR continued to have a big presence at CES like in past years, artificial intelligence (AI) was one of the stars of the show. We saw more devices—beyond robots and smartphones—touting AI capabilities as automakers and home appliance manufacturers showcased exciting voice control integrations in cars, fridges, washing machines, TVs and more. Amid all of the hype around the technologies that took center stage at this year’s CES, it was clear that data remains at the heart of our connected world. With advancements in connectivity comes the explosion of digital traffic as data is created, accessed, stored and moved to the cloud by billions of connected devices, appliances, cars, enterprises and more. Autonomous cars, VR and AI all depend on high bandwidth video and data to deliver smart and seamless experiences for consumers. At CES Marvell demonstrated how we are enabling the ecosystem to overcome its toughest data storage and network bandwidth challenges with our advanced solutions for the cloud, automotive, industrial, enterprise and consumer markets. Our automotive Ethernet physical layer (PHY) transceiver provides the robust 1000BASE-T1 connectivity needed to distribute data between the multiple advanced in-vehicle systems of tomorrow’s cars. As data is moved and stored from consumer devices to the cloud, data centers can take advantage of our support for a range of Ethernet technology speeds for even greater accessibility, including our Prestera® switches, Alaska® Ethernet transceivers and ARMADA® 64-bit ARM-based modular SoC families for 10 Gigabit Ethernet (GbE), 25 GbE and 40 GbE. We also demonstrated at CES our recently announced 25GbE end-to-end data center solution which underscores our commitment to delivering high performance, cost-effective and energy-efficient computing solutions to keep up with today’s increasing bandwidth demands. What we saw at CES validates the work we do at Marvell, providing industry-leading solutions that help our customers move and store data fast, securely, reliably and efficiently across a wide range of applications, systems and platforms. 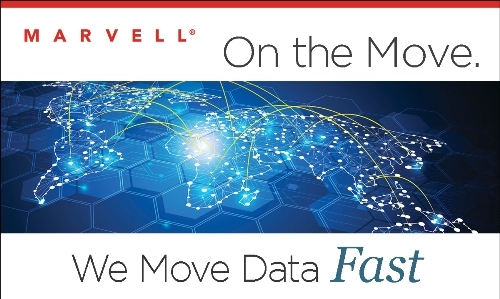 For whatever new demands and challenges the market brings in 2017, Marvell is on the Move.